increasing in popularity as many people discover their benefits. A living wall is a display of plants and organisms arranged vertically on a wall or fence. this type of organic structure can be an important part of your backyard landscape. You may construct a large and ornate wall or keep it small and unfussy. Building a garden wall is easy, and there are countless arrangements to choose from. There are numerous advantages to building a living wall in your backyard. One of the greatest benefits is the eco-friendly factor. A garden wall removes unhealthy contaminants from the air. It also attracts useful organisms that benefit the environment. Additionally, a living wall that is constructed on a building reduces energy consumption as it shields the building from the heat and cold. Building a green wall may increase the longevity of your home’s exterior as well. By covering the outer walls of your house, you will protect the surfaces from wind, UV radiation and rain. Shielding your house from the elements means spending less money on repairing siding or cleaning bricks. You can invest your savings back into the wall or create an entirely new one. In addition to being cost-efficient and environmentally friendly, garden walls are good for the soul. How often do you wish you could escape from the world for just a few minutes? 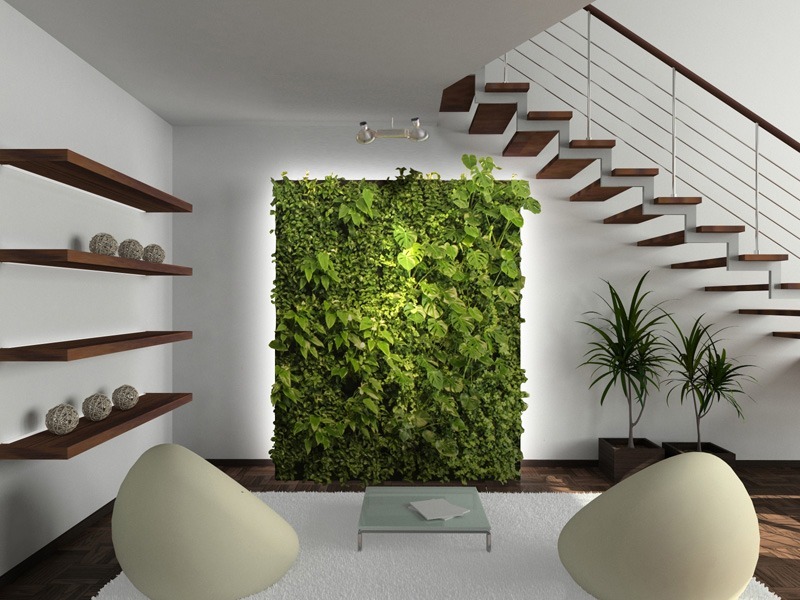 A living wall allows you to take a spiritual retreat anytime you need one. The eye-catching, captivating, alluring living art on a green wall can have a significantly positive impact on your mental and physical well-being. Before you begin designing your living wall, you need to find it a home. Using a fence as a base is the easiest method for beginners. If you plan to use the side of your house instead, you will need to purchase some masonry hooks. To assemble your own structure, determine where you will place it before you begin building. Choose a sunny location, but make sure the wall is placed somewhere you can enjoy all the benefits it provides. You can construct your wall from virtually any material, including old shutters. If you use a wooden structure, seal the wood with a varnish, or paint it in a shade that will complement your living organisms. Depending on your skill level and personal needs, an organic wall may be a simple arrangement or an entire ecosystem. The most basic display could consist of one vine or climbing plant. A more complex green wall should have some horizontal bases for plants to grow on. 1. Stagger shelves of various sizes onto the unit. 2. Hook several flat-sided pots to the wall. 3. Hang an array of containers from the top of the structure. 4. Build a base from pavers or bricks to house aquatic organisms or larger plants. 5. Position the wall so each plant receives enough sunlight and water. 6. Allow enough air to pass through the wall and plants. 7. On solid walls, attach wires or masonry hooks for plants to wrap around. Choose a diverse collection of native plants for your wall, and research each plant’s need for light, water and temperature. In a more complex structure, use a drip irrigation system so all organisms receive enough water. Add organic soil to the shelves and pots. When choosing your plants, select a variety of colors, sizes and textures. Intermix climbing vines, cascading plants and potted perennials. To create a complete ecosystem on your wall, introduce other organisms such as ladybugs, bees, butterflies, mollusks, amphibians, fish and microorganisms. You can do this by adding microbe-rich soil, using organic fertilizers, building an aquatic base, and using plants that attract various forms of life. Once you introduce these valuable organisms, your wall can become self-sustaining. Constructing a green wall will give your yard a stunning focal point. You can watch your wall come to life as each living organism grows and flourishes. If you are hesitant about building a living wall, start out small and work your way to a larger display. Install It Direct can offer more suggestions on how to enhance your backyard with a living wall. Join our mailing list today for insider deals and tips on all your landscaping needs.